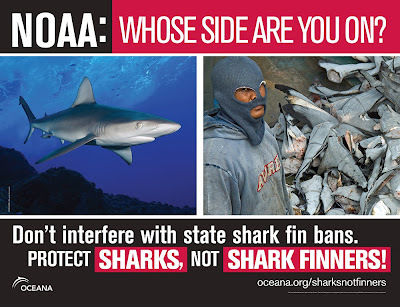 Shark Defenders: Oceana Asks NOAA: Whose Side Are You On? Oceana Asks NOAA: Whose Side Are You On? On July 9, Rep. Jared Huffman of California and 61 other Members of Congress wrote to NOAA’s Acting Administrator Dr. Kathryn Sullivan, asking the agency to withdraw its attempt to preempt the state shark fin bans. Just this month, Sen. Jay Rockefeller (D-WV) also wrote to NOAA in support of the state shark fin bans. For more than a decade, Oceana and other environmental groups have championed shark conservation in the United States. Following the passage of the Shark Conservation Act of 2010, which banned shark finning in U.S. waters, several states – Hawaii, Washington, Oregon, California, Maryland, Delaware, Illinois and New York – enacted legislation to further protect sharks by banning the sale, trade, distribution and possession of shark fins. For more information about Oceana’s campaign to save sharks, please visit www.oceana.org/sharksnotfinners. A long list of notable governors, congressmen, senators, state representatives, and conservationists are standing up to the Obama Administration proposal to overturn the 11 state and territorial shark fin trade bans. We don't have a timeline of when the final rule will be published, but will keep you informed as the situation develops. If you'd like to be involved, you can take the Shark Defenders Pledge and join our email list.